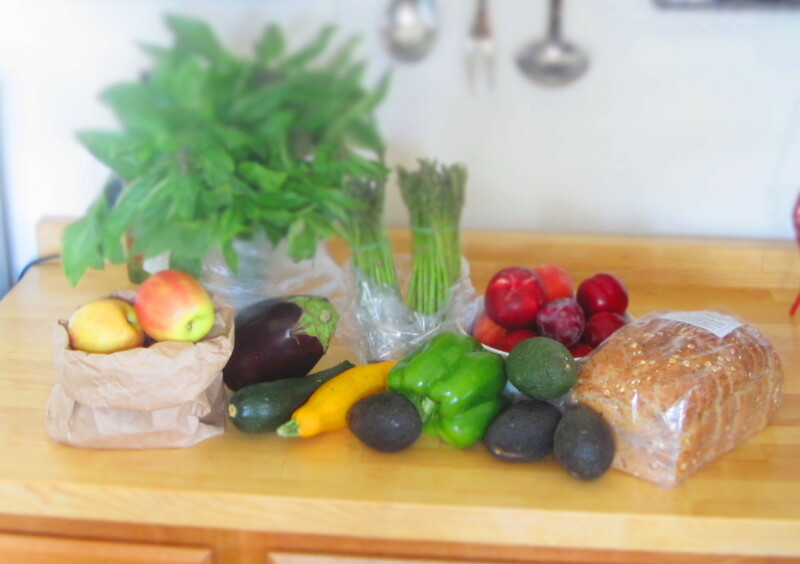 Saturday morning Klint and I drove down the street to a local farmer’s market. We pulled into a large parking lot. As we got out of the car I looked down the narrow lane lined snugly with fresh picked produce stands and was enthralled. All the people, all the colorful produce, the smell of sweet basil, this is my love language. We first took a stroll down the path to survey and take it all in. Leisurely we turned and went back down the path to purchase and filled our bag with juicy organic peaches, plums, Fuji apples (which the vendor called, “Oh my gosh apples”) and sun dried tomato & garlic hummus. My husband’s eyes and nose were then drawn to a food stand that featured Mexican corn bowls. Anything with cumin, cilantro and avocado will draw him in quicker than ESPN. As he read the description of the dish I started thinking of ways to create our own that night. So, we occupied the remaining room in our bag with eggplant, asparagus, avocados, zucchini and a huge bouquet of fragrant green basil. I knew I had some brown basmati rice and vegetable broth at home, so this whole dinner was inspired and created by our morning outing. 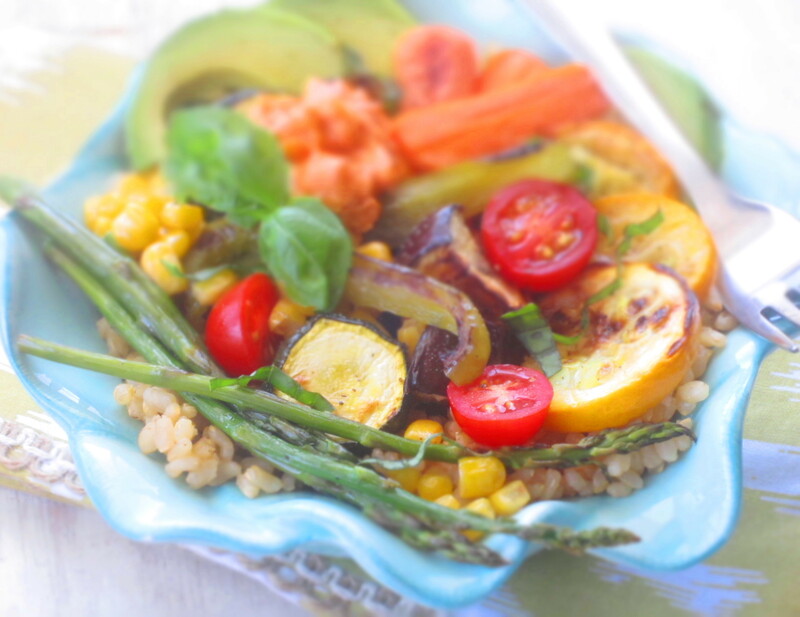 Yes, it’s vegetarian but so, so filling with the variety of roasted vegetables and rice. I used brown Basmati rice which is a short grain, heartier looking rice. Cooking the rice in broth infuses more flavor than water. I topped ours with the creamy sun dried tomato & garlic hummus we picked up from a Mediterranean stand, it was silky smooth like butter, yum. The fresh basil and avocado add depth of flavor and texture. We also sliced up a couple white nectarines on the side and dinner was served. Make as a main, or side dish. 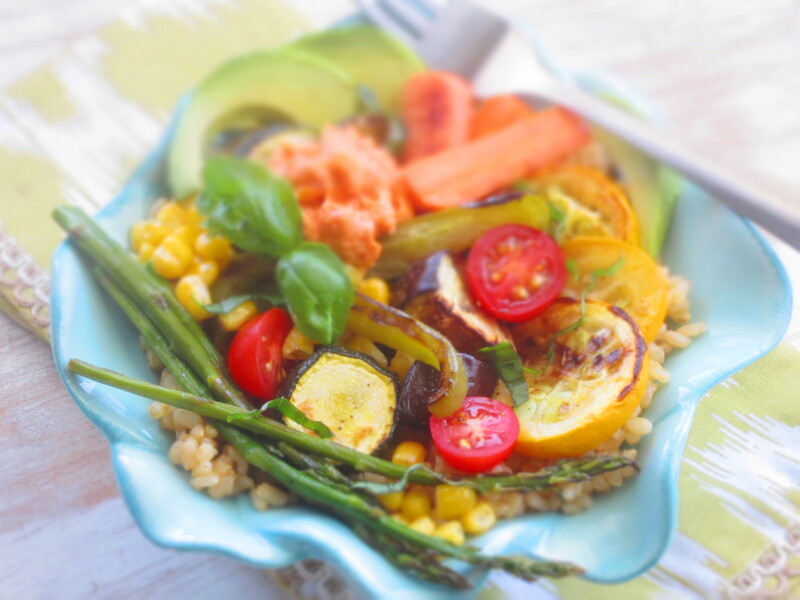 Easily prepare rice and roast vegetables ahead, refrigerate and reheat before serving. Hands down one of my favorite meals I’ve made this summer. Klint agreed and no meat was added. I guess husbands can change. *Gluten free option: Use GF vegetable broth and hummus. 1. 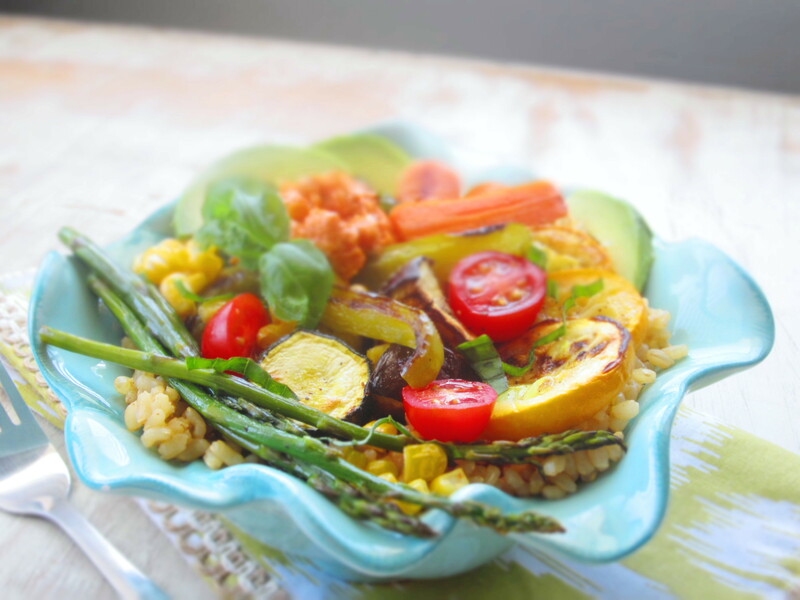 Combine vegetable broth and brown rice in a small sauce pan over medium heat. Cover and cook rice according to package directions, or until liquid is absorbed and rice is softened. Fluff with a fork and set aside. 2. Preheat oven to 450 degrees F. Spray two large rimmed baking sheets with cooking spray. 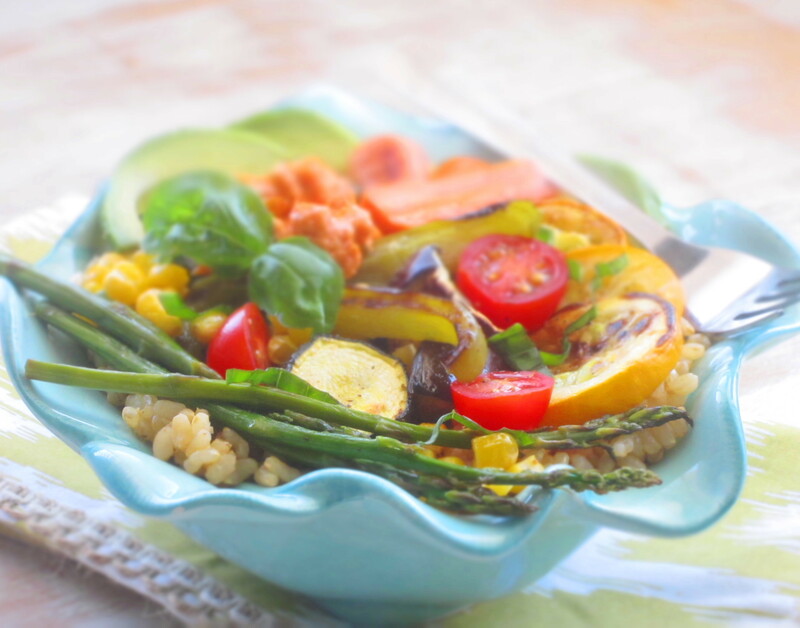 Place chopped vegetables (except corn and tomatoes) and whole garlic cloves on prepared pans. Drizzle with olive oil, salt and pepper; toss with hands to coat well. 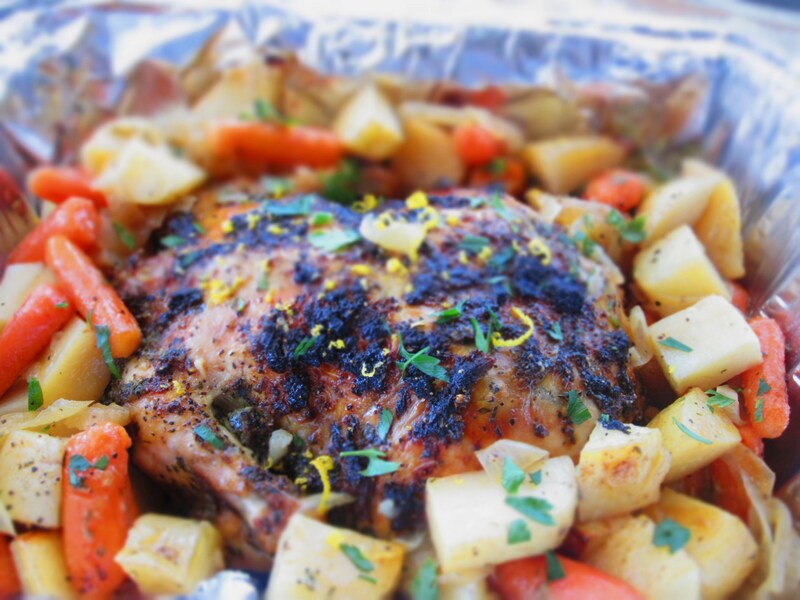 Roast in oven 10 minutes, remove carrots, asparagus and garlic if crisp-tender or golden brown. Flip remaining vegetables and continue baking for an additional 10-15 minutes or until starting to brown (add corn the last 5 minutes of cooking time). 3. Chop or slice roasted garlic and sprinkle on vegetables. Slice or chop avocado and drizzle with fresh lemon juice. Divide warm rice equally into 4 bowls. Top with fresh basil, 1/4 of the garlic vegetables, more fresh basil, cherry tomato halves, 1/4 of the avocado, 2 T. hummus and 1/2 T. drizzle of balsamic vinegar, if desired, and extra salt and pepper if needed. Serves 4. I also topped mine with crushed red pepper for a little kick. VARIATIONS: Add any vegetable you like (broccoli, peas, fresh spinach, sun dried tomatoes, etc) Top with grilled chicken, shrimp or lean steak for added protein. 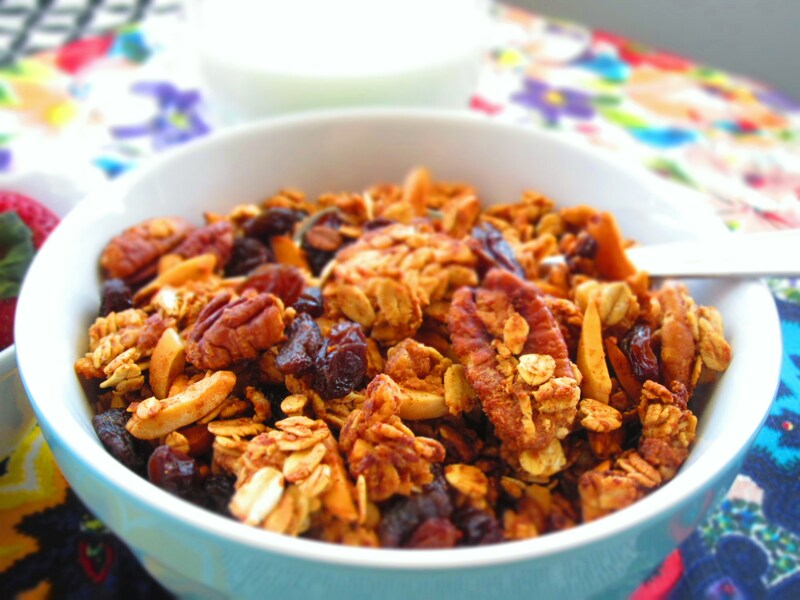 NUTRITION INFO PER SERVING: 520 calories, 18g fat, 2.5g sat fat, 84g carb, 17g fiber, 15g sugar, 16g protein. 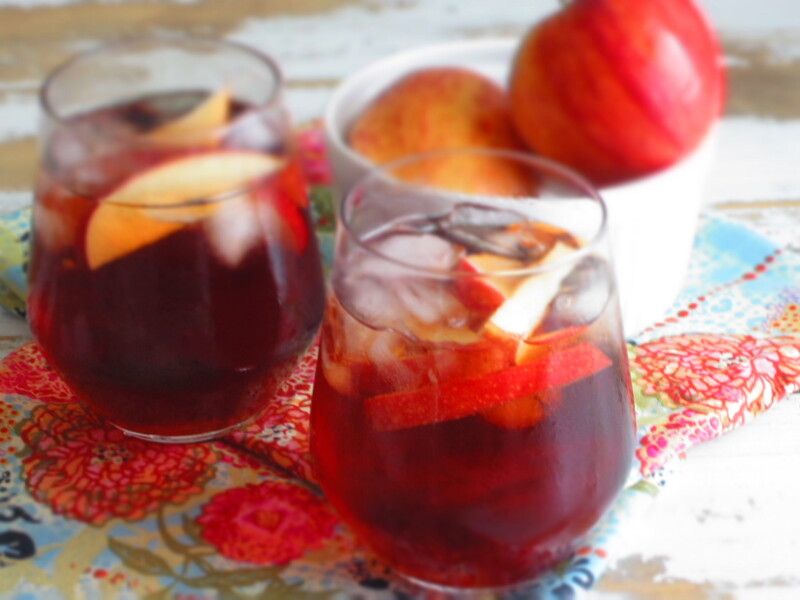 I’ve been mulling this recipe over in my head for a while. 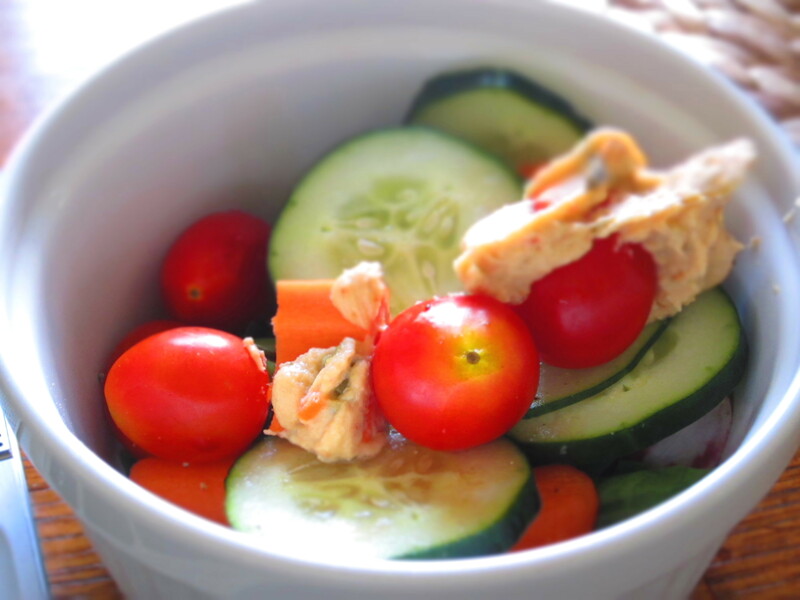 I love refreshing Spring vegetables and herbs. Asparagus, peas, chives, Brussels sprouts, mint and lemon … ah, they’re like going to the spa. 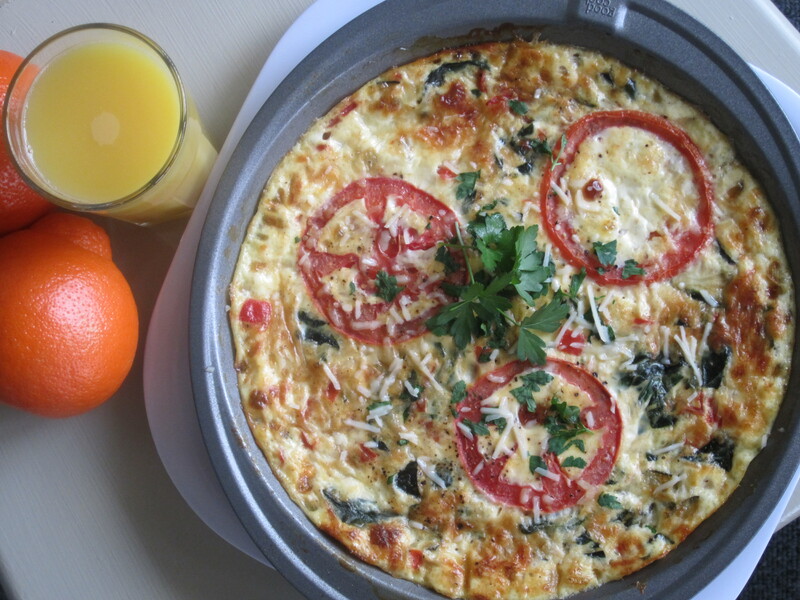 This frittata is heart healthy with 2 whole eggs and the remaining filling composed of protein packed egg whites, sautéed vegetables and flavorful garlic. A very versatile and easy meal. I had a large wedge for lunch yesterday topped with a dollop of garden hummus, side fresh veg and spring greens topped with balsamic and more hummus (I’m a sucker for hummus, it’s like sour cream). 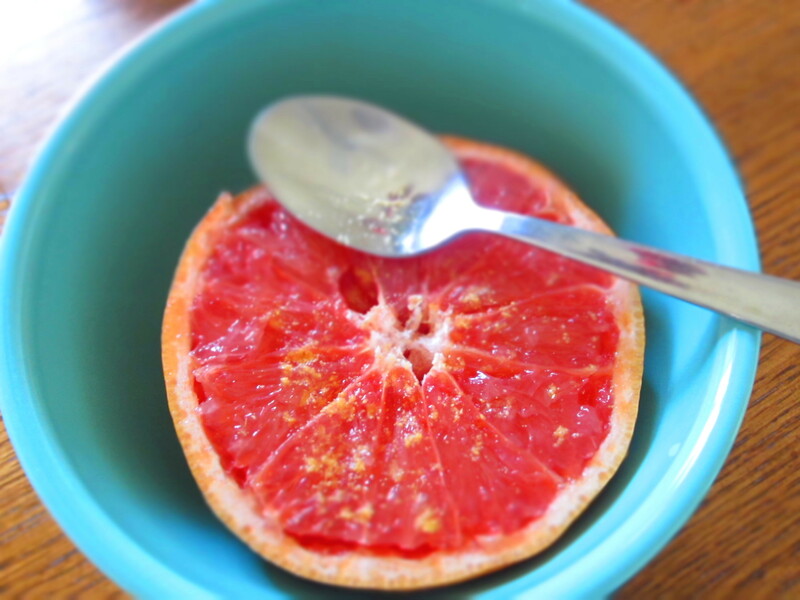 My dessert was a whole grapefruit topped with ground ginger. Delicious! 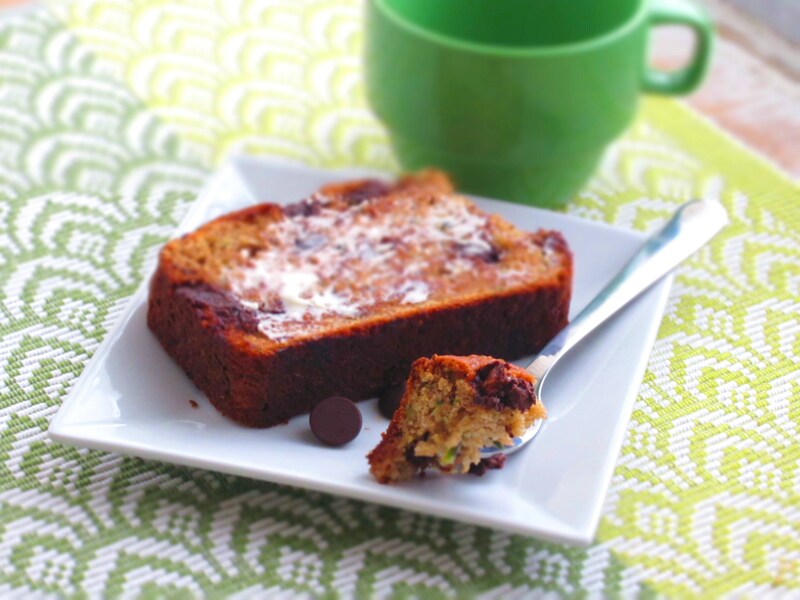 (I’ll post my breakfast next time around – it involves sweet cherries and vanilla). 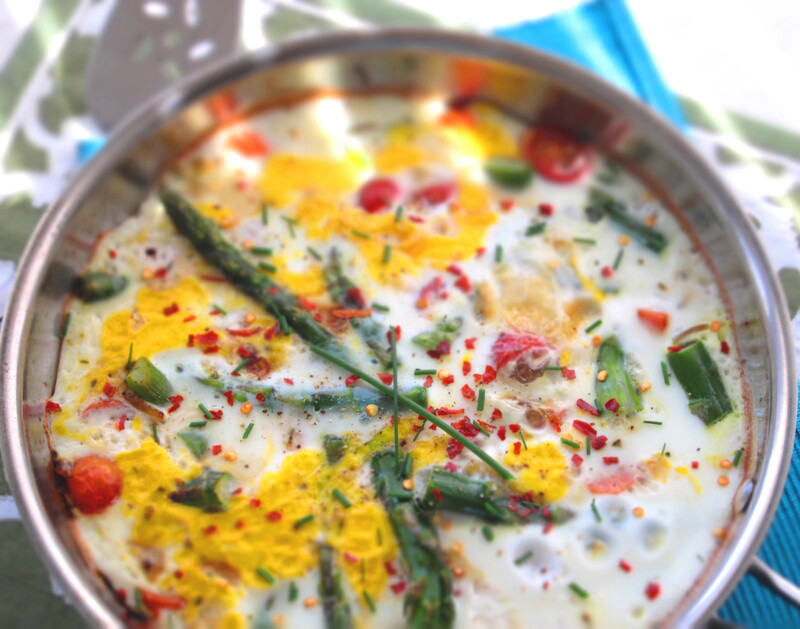 If you are a dairy lover feel free to add some great cheese or low fat cottage cheese to the eggs before pouring into the pan. Other vegetables would be great too like chopped broccoli, zucchini, peas or mushrooms. Serve for a Sunday brunch with my Avocado & Grapefruit Salad, Potato-Cheddar Bites and Low fat Cherry Almond Muffins (only 150 calories each!). For a refreshing beverage add cucumber slices, lemon and fresh mint to a pitcher of water and chill. 2. Heat a 10-inch oven proof skillet sprayed with cooking spray and 1 tsp olive oil over medium heat. 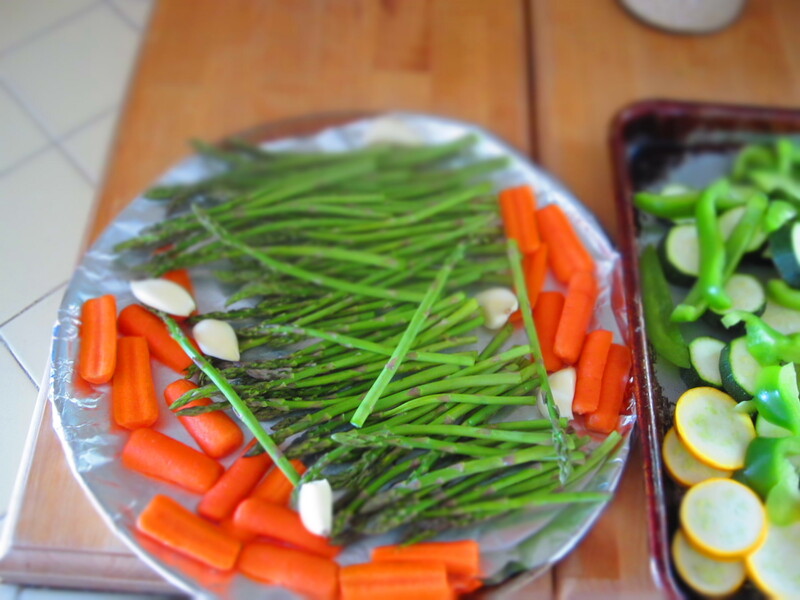 Sauté onion, carrot and asparagus for 5-6 minutes or until crisp tender and starting to brown. Add garlic, tomatoes, Italian seasoning, salt and pepper to taste. Continue cooking 1 or 2 minutes, stirring to not burn garlic. Reduce heat to medium-low. 3. 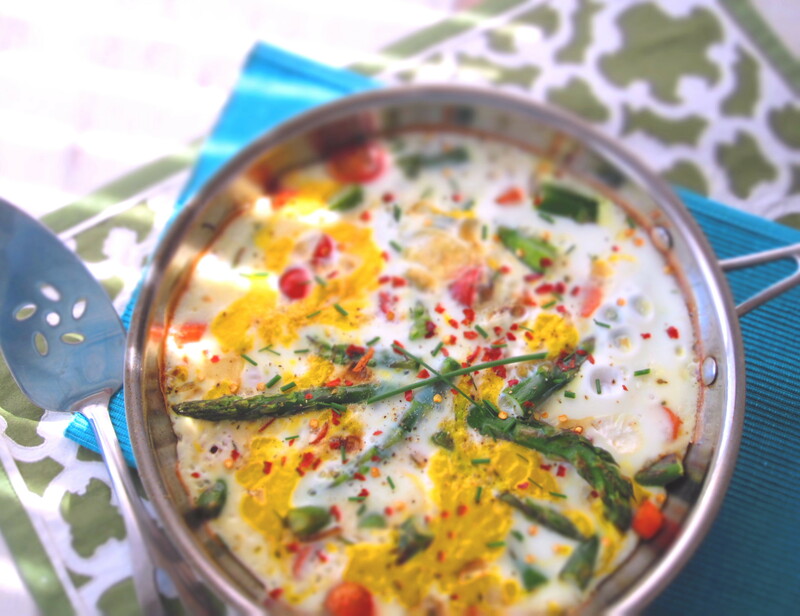 In a large bowl whisk 2 whole eggs with 10 egg whites (add a couple tablespoons of water to thin slightly if desired) and pour mixture into pan over sautéed vegetables (may lay asparagus spears flat in a circle before pouring eggs over for presentation). Sprinkle again with salt and pepper and let cook in on stove top 2-3 minutes, then place skillet in oven and bake for 8-10 minutes or until set and cooked through. Sprinkle top with fresh chopped chives, basil and red pepper flake if desired. 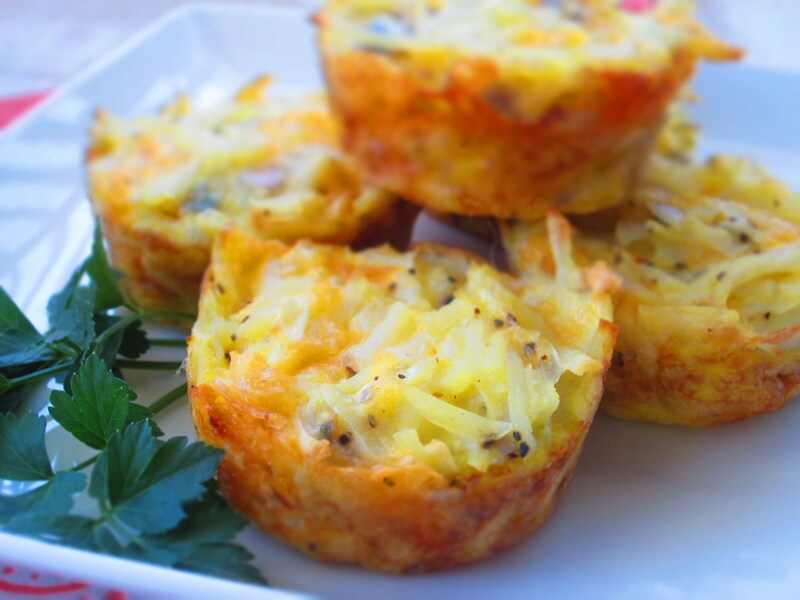 Cut into 4 large wedges and serve, serving size 1 large wedge. Top with creamy hummus, avocado, salsa or Greek yogurt. VARIATIONS: Add 1/2 cup crumbled feta, mozzarella or goat cheese, mushrooms or other vegetables like baby spinach, chopped zucchini, broccoli florets or bell peppers. For meat version add 4 slices lean turkey bacon or sausage. 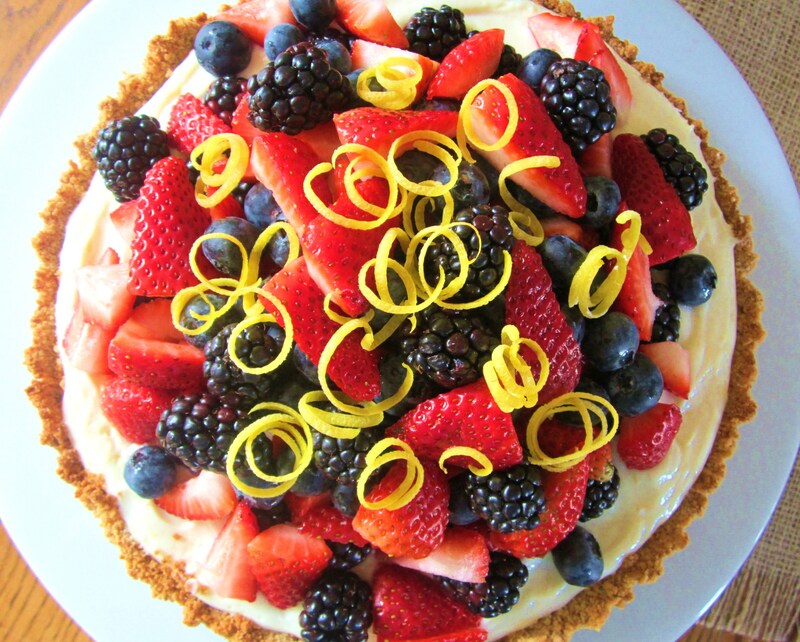 Easily make dessert ahead and freeze, top with berries and cream day of serving. The ultimate spring appetizer or side dish. This one is for any of you that made my chicken pot pie recipe and have phyllo dough staring you down every time you open the freezer door. 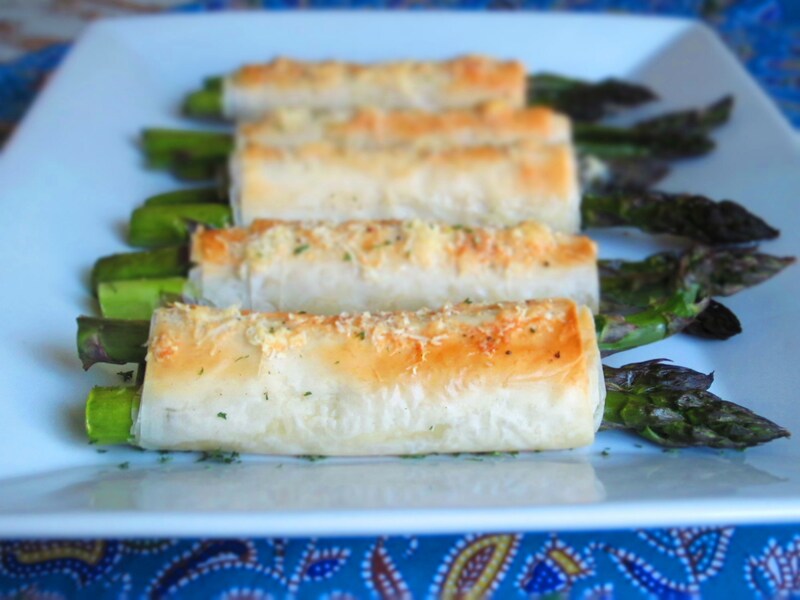 Continuing to use up my Costco size bag of asparagus from my grandma, with fresh roasted asparagus, wrapped in crunchy baked phyllo and topped with slightly salty parmesan cheese. These little presents look like you spent hours in the kitchen, when 10 minutes prep is all you need. 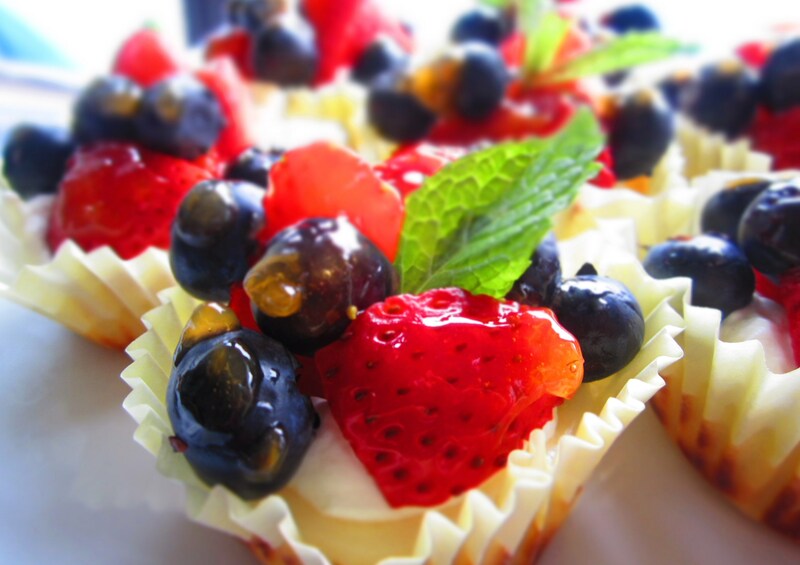 Surprise your family or guests with something new, flavorful, healthy and can I just say, “cute”? This one might even get kids to like asparagus! 1. 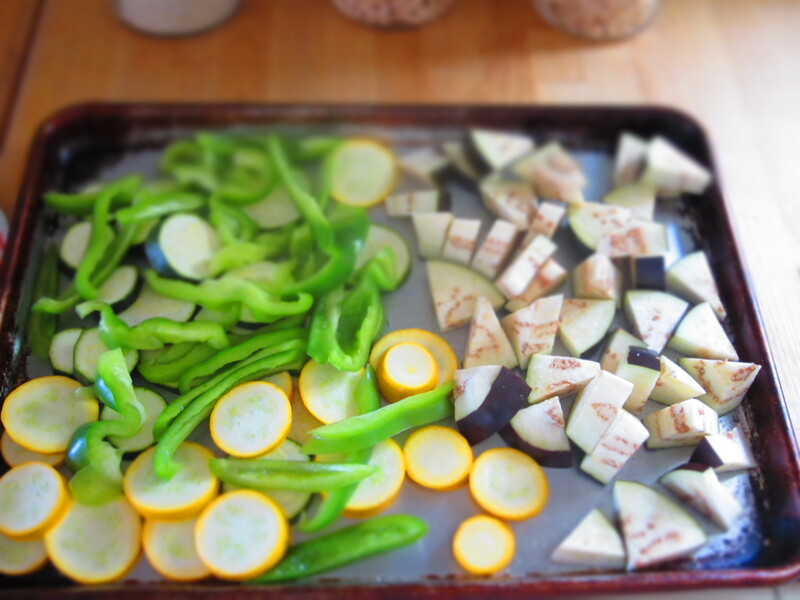 Preheat oven to 375 degrees and spray a baking sheet with cooking spray, set aside. 2. Lay one sheet of phyllo dough on a working surface (like a cutting board) spray with cooking spray, top with a second phyllo sheet, spray and press down gently to adhere. Fold over both sheets in half lengthwise and spray once more (may need to fold a second time lengthwise if asparagus is shorter in length). 3. 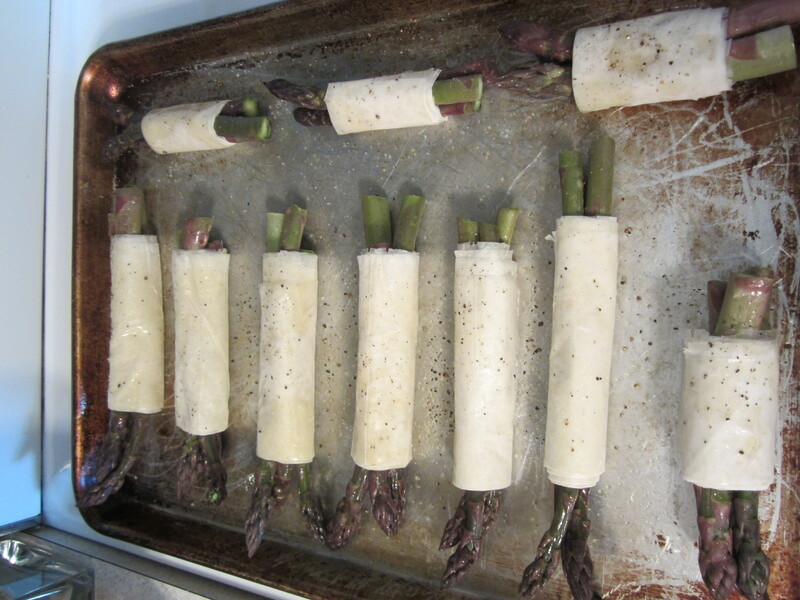 Take three similar length spears of asparagus, starting at far left end of phyllo, roll up asparagus in phyllo and gently press seam to board to seal. 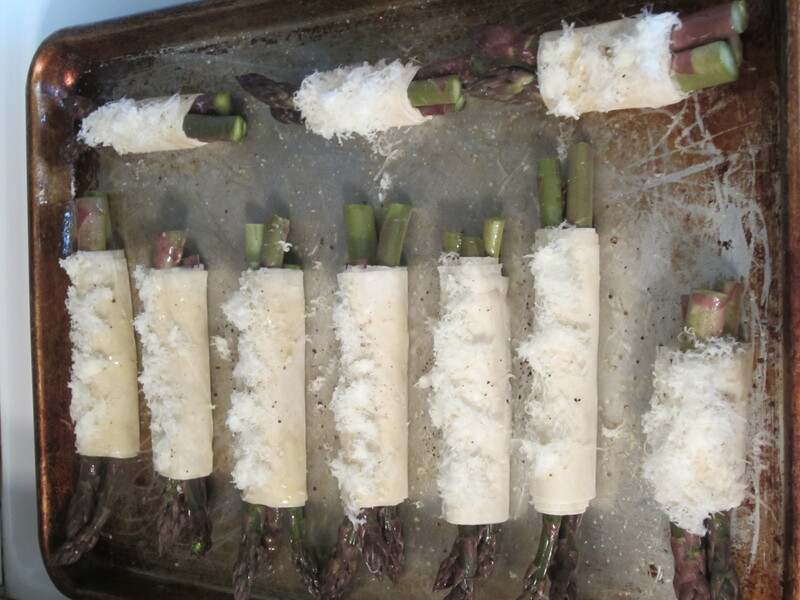 Place wrapped bundle on the prepared baking sheet, brush or spray tops with olive oil (including asparagus), salt, pepper and about 1 tsp shredded parmesan. Repeat process with remaining ingredients. 4. Bake for 10 minutes in preheated oven, then broil tops for 3-4 minutes or until phyllo is golden brown and crunchy (watch carefully not to burn – I always seem to burn when broiling.) Makes 10 bundles. Appetizer serving size: 1 bundle. 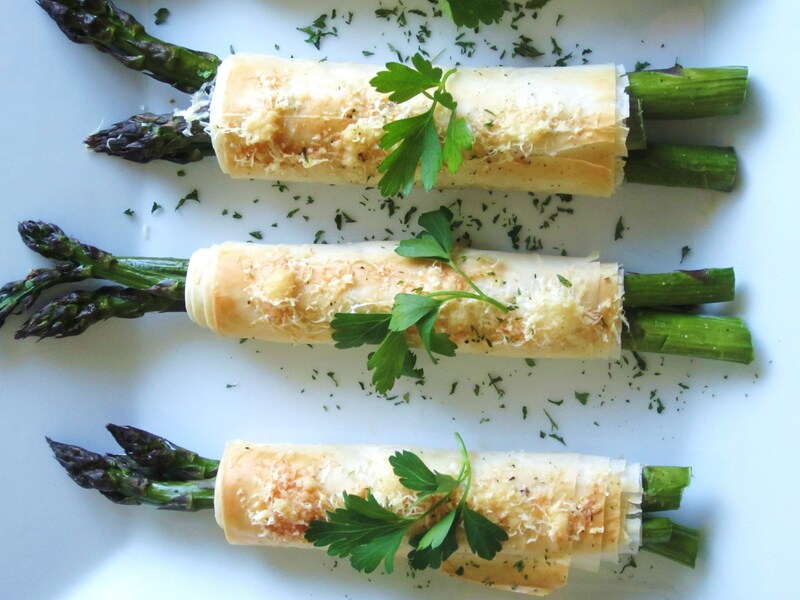 VARIATIONS: Use one phyllo sheet per bundle, in same process above, for a side dish(serving recommendation – 3 bundles) and fewer calories (80 calories per bundle). Add lemon zest for a bright citrus flavor and garnish. And for anyone feeling their creative juices flowing, tie a green onion (just bright green part) around the middle of the baked phyllo part of bundle. Hope you are all enjoying a colorful Spring! 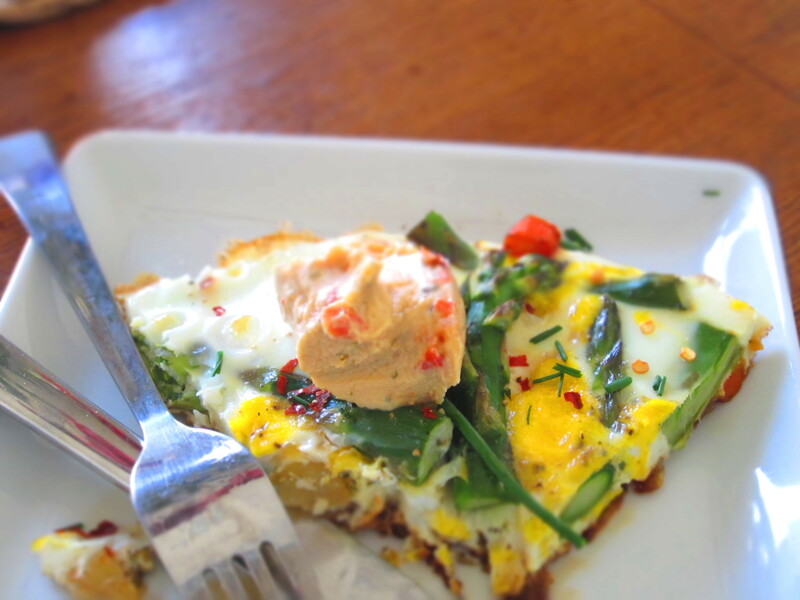 This is not your old, boring, and incredibly unhealthy, drive-through egg sandwich. Layers of flavor combine to create this amazingly easy dish (that looks like you went to a restaurant). 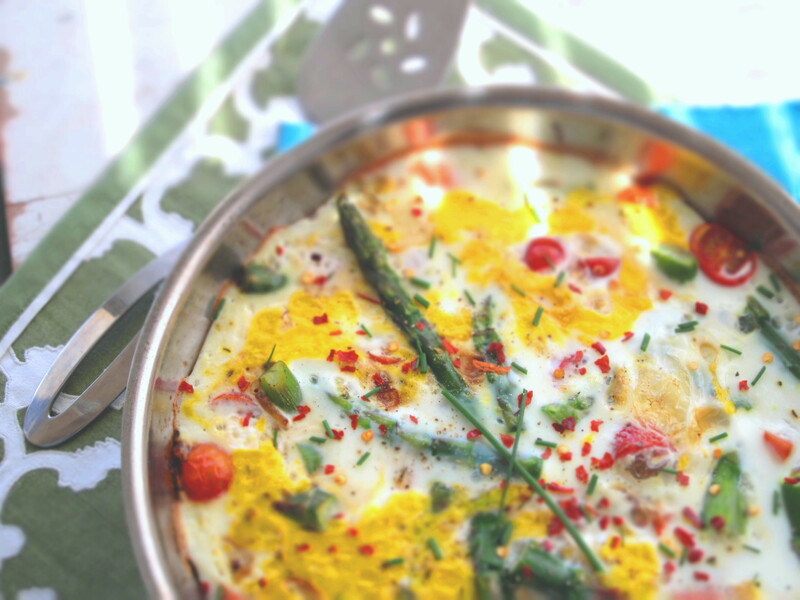 Great for upcoming outdoor Spring parties or asparagus abundance. 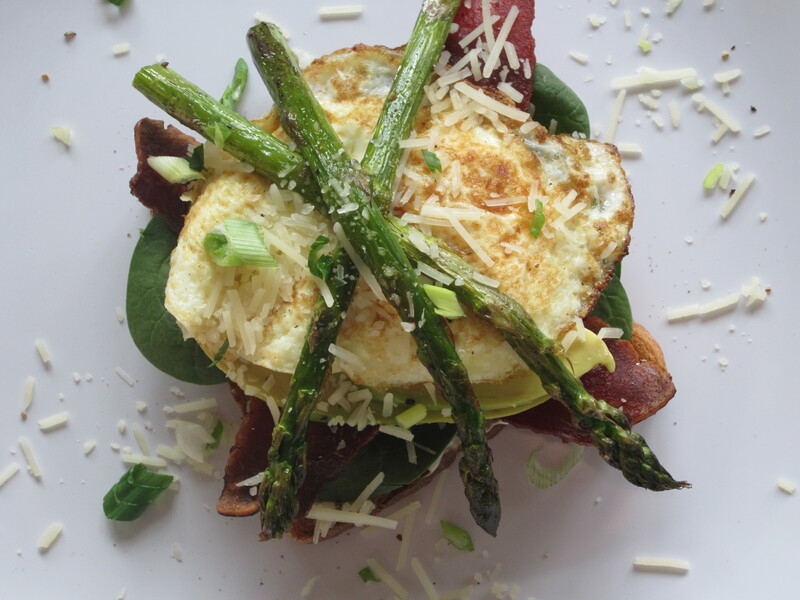 Creamy avocado, crispy turkey bacon, herb garlic mayo and roasted asparagus surround a beautiful fried egg, all piled on top of toasty bread. 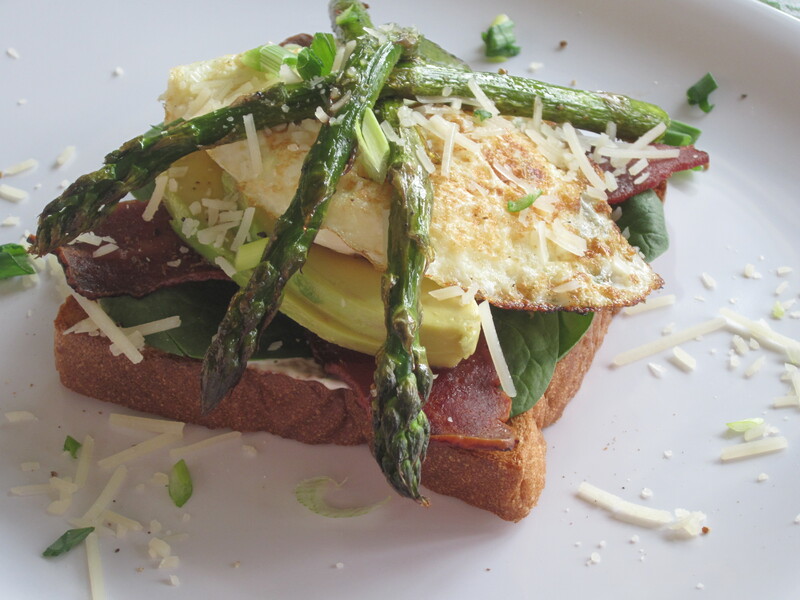 Show off your culinary skills and make this delicious sandwich the star of your weekend dinner, brunch or lunch. Serve with a side of homemade potato wedges, sweet corn on the cob, or a big green salad. 1. For the herb mayo: whisk together mayo, garlic powder, parsley, 1/2 t. lemon juice, salt and pepper to taste. Store covered in refrigerator until ready to use. 2. 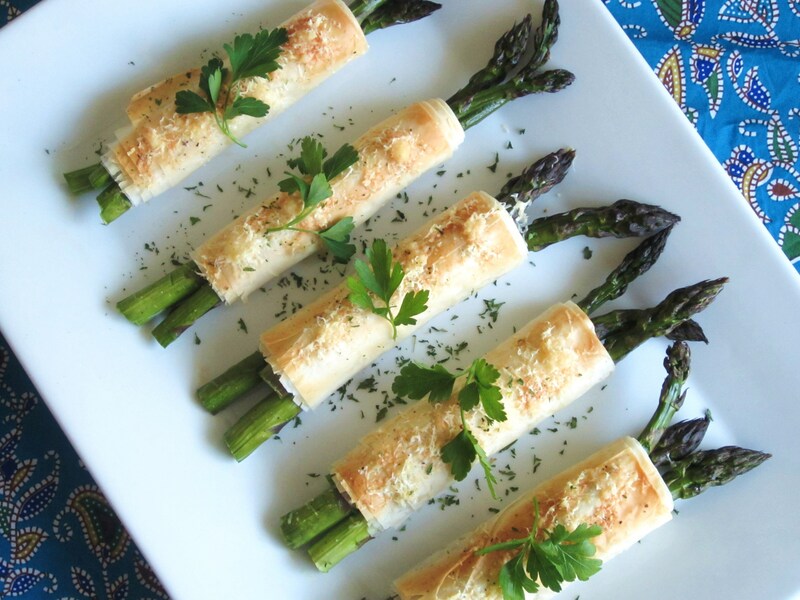 Place the asparagus on a rimmed baking sheet, drizzle with olive oil, salt, pepper and toss with hands to coat. Bake at 400 degrees for 12-15 minutes or until starts to lightly brown. 3. 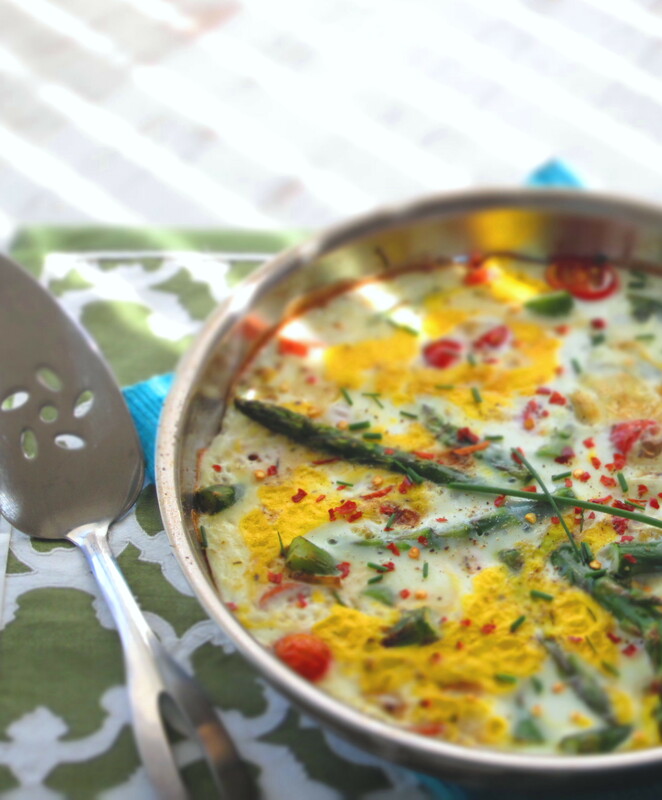 While the asparagus is baking fry the eggs (to your liking – mine were over medium) in a skillet sprayed with cooking spray. 4. Slice the avocado and drizzle with fresh lemon juice to keep from browning. 5. 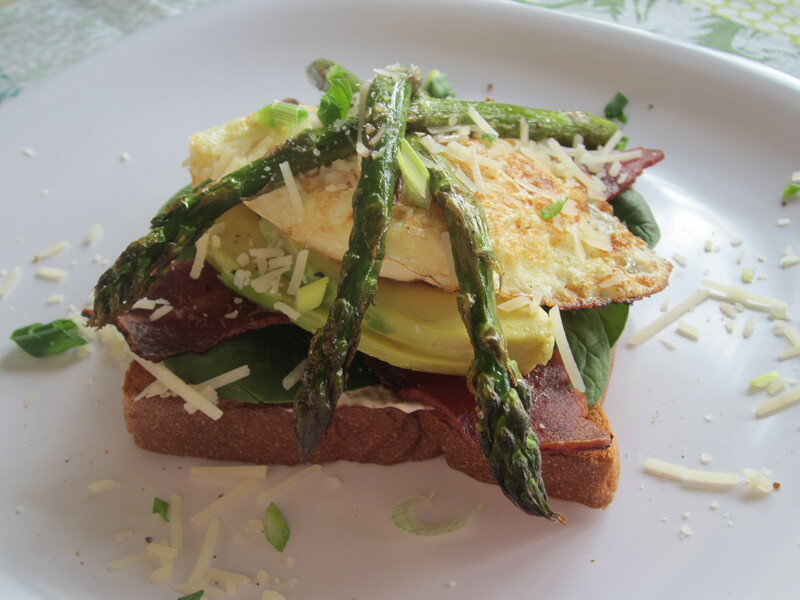 To assemble the sandwiches: spread mayo on toasted bread, layer a few spinach leaves, 3 slices crispy bacon, 2 avocado slices, 1 egg, 3 asparagus spears, 1 tsp parmesan cheese, salt and pepper if desired, and sprinkling of green or red onion (optional). 6. Serve on a large platter with extra herb mayo on the side. Serving size: 1 open face sandwich.